Abdominal pain, loss of appetite, bloating, vomiting, constipation, cramps, diarrhea and weight problems? There is a strong possibility that you suffer from food intolerances and a leaky gut. The only solution is a food intolerance test and a stool analysis. Once we have the results we can start a process of healing the gut so that you can feel much better. An allergy is an adverse reaction (hypersensitivity) resulting from exposure to a normally harmless substance (allergen). This substance may be a drug, a food, or some other environmental agent such as dust, dust-mites, pets, or pollens. The reaction may manifest itself in various ways including skin rashes, sneezing, swelling of the tissue or mucous membranes, and a number of very violent reactions that can result in anaphylactic shock or death. Adverse reactions to food can cause a range of symptoms throughout the body. Some of these reactions are mediated through the immune system by IgE, and some by IgG. 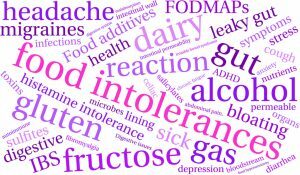 Severe IgE-mediated food reactions affect approximately 1.5% of the population. These can be extremely serious, and may be life threatening. 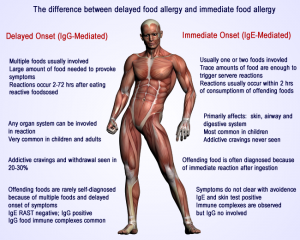 IgE-mediated food allergy reactions appear almost immediately (within 2 hours) after ingestion of an offending food. Symptoms may take the form of swelling of lips or throat, sudden and violent skin rashes, vomiting and other gastrointestinal problems, sudden asthmatic breathing, and anaphylactic shock. Shellfish and peanuts are the most common allergens that can result in severe reactions in adults. In young children, the most common offending food allergens are egg white, cow’s milk, wheat, peanuts and soy. In the US alone, about 3 million Americans suffer from peanut allergies, and of the 150 children who die every year from food allergy reactions, 100 deaths are attributed to peanuts. Testing for susceptibility to severe food reactions is normally done by looking for IgE antibodies to the allergen in question. Classical methods include total IgE testing for general susceptibility, and the RAST™ method or skin prick testing for various specific allergens. Less severe reactions, often referred to as Food Intolerances, are much more common and affect approximately 45% of the population in one way or another. There are several possible causes of Food Intolerance, including enzyme deficiency, reactions to chemicals in foods, and delayed food allergies mediated by the IgG antibody. The prevalence of Food Intolerance is fueled by the fact that modern diets include foods that are more exotic, new additives and new methods of containing and preserving foods. IgG-mediated food allergic reactions have a delayed onset (2-72 hours) after ingestion of an offending food. Among some of the more serious diseases that have been linked to food intolerances are Cohn’s Disease, Ulcerative Colitis, Celiac Disease, Asthma, Rheumatoid Arthritis, Psoriasis, Rosacaea, Eczema, and Multiple Sclerosis. Most diseases start in the digestive system. Keep your digestive system healthy and happy and you do not have to suffer your whole life with the above diseases. See your Healthcare Specialist and get tested and experience optimal health and well being again.